While the attention of the media concerned with space industry is focused on the biggest and most flashy objects – rockets – there is a silent revolution going on that escapes attention of most. We’re stepping into the first mass production of the satellites – a space equivalent to the introduction of the Ford Model T.
When Model T was introduced in 1908, cars have existed for almost 100 years already. The majority of them were built individually, only one at a time, but in later years craft-production was introduced. One notable example is Benz Patent-Motorwagen, 25 units of which were built. Today’s satellite production is not much different – space agencies order bespoke satellites, each different and tailored to their specific mission. Commercial satellite operators, on the other hand, order satellites that can share components through what is called a satellite bus – an already designed service module (base of the satellite, providing propulsion, power, thermal control, navigation) for which individual payloads are designed (antennas, transceivers, amplifiers and much more). This standardization however goes only so far – satellite buses are still built in low numbers and the end product can vary wildly. For example Eurostar 3000, one of the most popular satellite buses in the world, had only 36 satellites launched, with masses varying from 4600 kg to 6300 kg. In June 2017 something unseen on a market has happened. Airbus Space introduced the first serial production plant for the satellites in Toulouse, France. 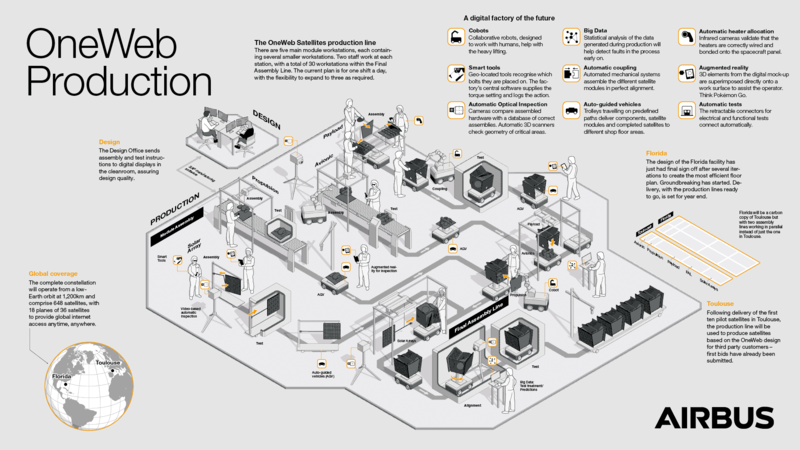 It’s currently building telecommunication satellites for the OneWeb’s megaconstellation, which will bring cheap satellite internet for everyone around the globe. In April 2018 Airbus will also open another factory, with double the capacity, in Florida, USA as well as announced contract and investment in EarthNow, company dedicated to providing live video earth observation. The total Airbus plan includes manufacture of over 2000 satellites, which is an enormous number considering that currently there is 4756 satellites in orbit, most of which are defunct. This unprecedented plan would be impossible to achieve without serial production and numerous cost-cutting measures. In its factory, Airbus makes an extensive use of robots for components transportation and the assembly of them in cooperation with engineers (so-called cobots: collaborative robots). Smart tools, automated coupling as well as numerous automated testing and inspection tools allow for delivering aerospace-grade products for a fraction of the cost and time required to build conventional satellites. However, Airbus is not alone since another European giant has emerged. 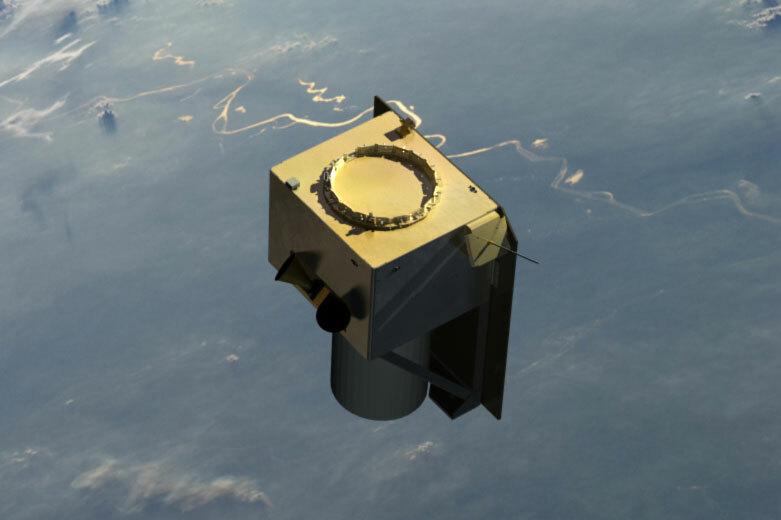 Thales Alenia Space purchased shares in American Spaceflight Industries and began working on a large-scale production of Earth-imaging satellites, forming joint venture called LeoStella LLC. Its primary customer BlackSky is a US-based satellite imaging company. New plant will be open for numerous external customers, which for many companies can mean a huge leap in image quality over tiny CubeSats at much lower prices than modern-day satellites. Cutting the costs of satellites is the top priority for building and growing space economy in a healthy, steady way. While CubeSats offer a great testbed for numerous technologies, their capabilities are very limited, which means that its further growth would have to be stimulated by availability of larger and much more capable platforms. And that’s where serially produced satellites make their entrance. Future prospects are very optimistic and the satellite market is definitely a space worth to watch in coming years.